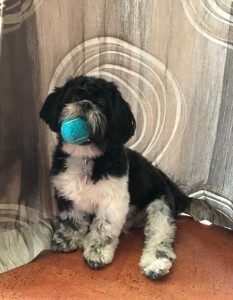 Pippin is our Shih Tzu door greeter and sock thief and he is always ready to play ball or tug-of-war! He enjoys various restorative poses as we practice and usually will show off his down-dog and up-dog poses at the end of class. Patch: R.I.P. 1999-2015 – Patch, we all love and miss you!